Last week it was announced that Uber had confidentially filed for an IPO (right after Lyft did the same). It could go public as early as Q1 of next year. And supposedly, a valuation of $120 billion is being tossed around. The company last raised money in August of this year (from Toyota) at a $76 billion valuation. – Uber has indicated that it doesn’t expect to be profitable for at least another 3 years. This year it is expected to hit between $10 and $11 billion in revenue, compared to $7.78 billion last year. 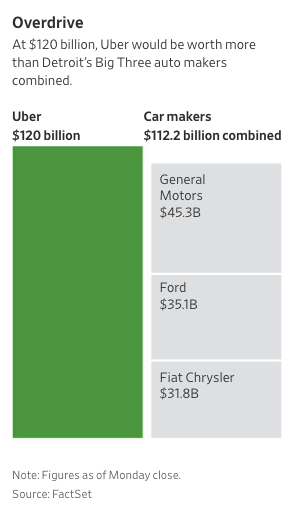 – Over 50 companies have invested in Uber since its founding, not including a slew of individual investments from people like Jeff Bezos of Amazon. On a related note, Fred Wilson, who is far more knowledgeable on this topic than I, recently published a post talking about the relationship between the private and public markets and what could happen to (tech) valuations in 2019. It’s a good follow-on read to the above.